SIMon is an online visualisation tool that allows access to time series data of social indicators in Europe. It is developed and maintained by GESIS – Leibniz-Institute for the Social Sciences. The user interface was designed by Kognito Gestaltung. I recently came back from the 58th German Cartographer’s Conference in Berlin. A highlight was a speach given by the French cartographer Philippe Rekacewicz who is working for the United Nations Environment Programme and the French newspaper Monde Diplomatique that is translated in many languages. The title of his speach was “Drawing the world: cartography between science, art and manipulation”. Rekacewicz indeed has returned to drawing the world on paper with pencil for the sake of not being limited by the visualization capabilities that a digital system offers. Using this basic way of visualisation the emotion comes into his work as it is the case in a handmade piece of art. This way the work is of course subjective as Rekacewicz states – it reflects the cartographer’s view on the world or how he would like to visualize it making maps a possible tool for manipulation. However the maps he shows are based on real data making them a part of the scientific domain as well. Many of Rekacewicz’s work can be found in the Atlas on Globalisation from Monde Diplomatique. Unfortunately it is only available in French and German. Some people critisize it for not being neutral. But being neutral was probably not the intention. As said before a map is just one point of view. We cartographers are would-be emperors we draw borders and move mountains when we desire. 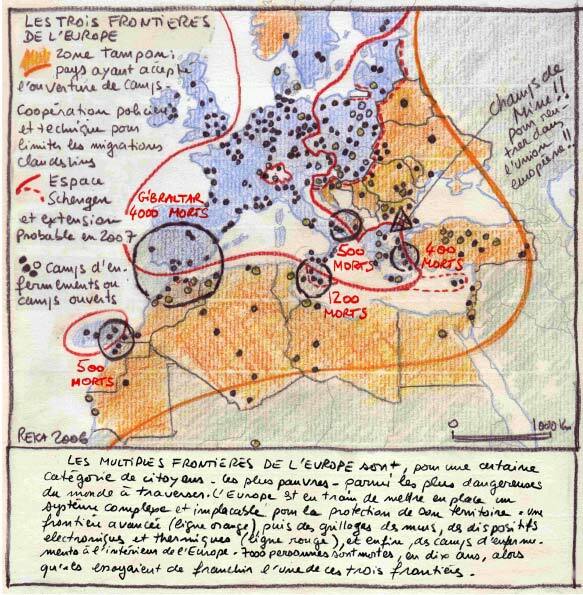 Below is a map from Monde Diplomatique that I find very impressing. It shows the European measures to seal itself off from immigrants. It is probably based on one of the typical pencil sketches by Rekacewicz that I added for comparison. The sketch reflects some of the author’s anger when producing that map. The Schengen-border is drawn as a (bloody) red line including number of deaths through attempts of crossing the border. More on the topic can be found here. 6(0) ways… – Electric Palm Tree from archis on Vimeo. The 2010 campaign for the European Solar Days is happening now. I want to use this occasion to present two graphics of which one shows the potential for photovoltaic solar power in Europe and the actual production of energy from solar power. Not sure if these are perfectly comparable since the map on use of solar power might include thermal solar power as well. However, it is striking that Germany is leading in this field although it is not really spoiled by the sun compared to the mediterranean countries. Political will and support from the government seem to speed up the transition towards a sustainable energy network. See article on feed-in tariffs in Germany. Could this be an example for other countries? Click here to see an interactive map of actual energy primary production from solar power (data from 2007). Volcanic ash from Iceland has stopped air traffic over Europe. No airplanes in the sky. What a uniqe day! There has been bright sunshine here today in Munich. The sky is however a bit hazy and it is not clearly blue – probably due to the ash in the air. Apart from that the sky has never been so clear. I enjoyed the sunny day outside walking over Munich’s biggest flea market at Theresienwiese. 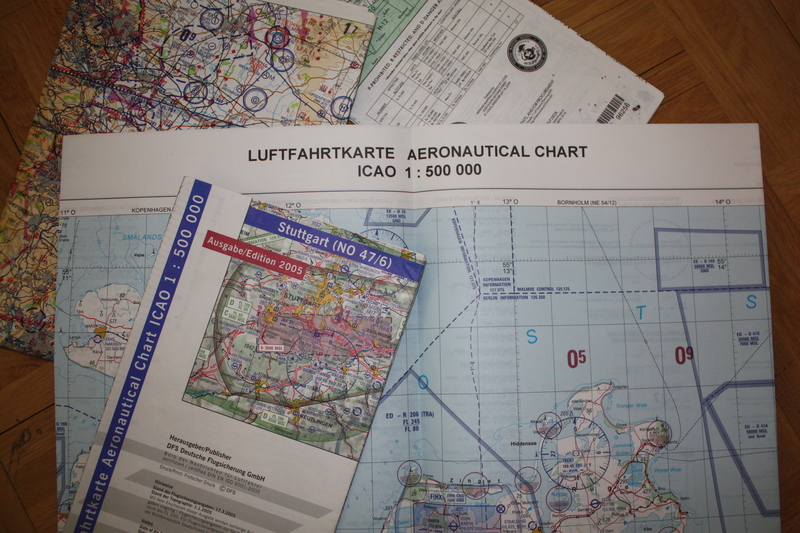 Ironically I found some old German and British aeronautical charts and bought them for a few euros. Here is a nice visualisation of daily air traffic in Europe to see what we are missing! Today is Equal Pay Day, a special day of action to point to the Gender Pay Gap. The following map shows the situation in Europe in 2008. Visualised are the employment rate for women and the Gender Pay Gap. There are remarkable differences between the European countries, however a pattern can hardly be identified. Striking is the high employment rate for women in the scandinavian countries. Considering the depicted countries Norway is leading with 75.4%. In Iceland it is 79.6% but recent data about the Gender Pay Gap is missing here. In contrast Malta has an employment rate for women below 40%. 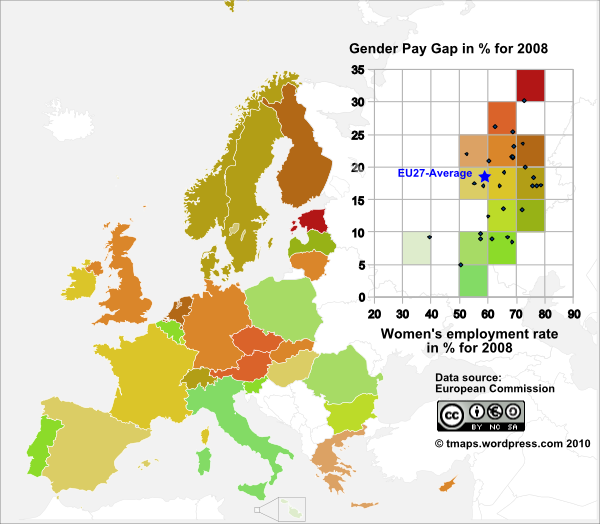 The smallest Gender Pay Gap is found in Italy (4.9%), the largest in Estonia (30.3%). The unadjusted Gender Pay Gap represents the difference between average gross hourly earnings of male paid employees and of female paid employees as a percentage of average gross hourly earnings of male paid employees. The population consists of all paid employees in enterprises with 10 employees or more (Eurostat). The employment rate for women is calculated by dividing the number of female persons aged 15 to 64 in employment by the total female population of the same age group. The indicator is based on the EU Labour Force Survey. The survey covers the entire population living in private households and excludes those in collective households such as boarding houses, halls of residence and hospitals (Eurostat).